What an amazing and historic season it was for the Lady Guardians! The season was marked by several highlights. For the first time ever the Lady Guardians placed 3rd in KAIAC Division 1, finishing the season with a 10-4 record in conference. Heading into the tournament the girls were full of confidence and ready to make some history. 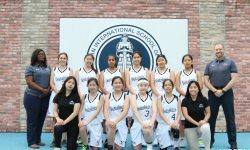 The tournament began with the girls defeating Osan American 47-22. A later loss to Seoul American put the Lady Guardians in the losers bracket semi-final agains number 1 seed, and undefeated regular season champs, Daegu American High School. The Lady Guardians would not back down and defeated the Warriors 41-38 to make it to the KAIAC Division 1 Championship Game for the first time in school history. 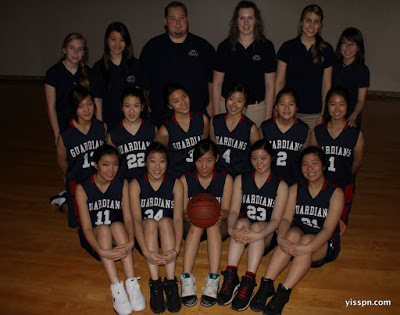 Although eventually losing to Seoul American High School, the Lady Guardians, led by All-Conference and lone Senior Jessi Son, proved to be one of the most resilient team in YISS history. During the season Jessi Son surpassed 1000 point for her career, making her only the second Lady Guardian, along with Esther Oh ’08, to reach the historic mark.